We suggest you arrive 15 minutes before your appointment to ensure a relaxing start to your spa experience. Late arrivals will reduce the time of our treatments, so we do not delay the next client. To preserve a peaceful experience for everyone, cell phones and pagers must be turned to a vibration. Phones can be used at a break in your appointment in the kitchen or office areas. We may require a valid credit card at the time of booking to secure your appointment. Please honor our 24 hour advance notice cancellation policy. Spa packages require 48 hours notice. No-show appointments will be billed the full service amount. Injury specific focus, increases flexibility, helps to speed up muscle recovery. Flowing movements release tension and soothe aching muscles. Increases circulation, assists in flushing toxins from the body, deeply relaxing. Focuses on the health of the energy field (aura) and energy centers (chakras). It is effective for physical relaxation, mental clarity, pain management, anxiety and stress reduction, and increasing one’s sense of vitality and ability to self-heal. The many responses to Healing Touch include a deep sense of relaxation, restored balance and well-being. Vibrational Therapy will be integrated as needed and may include crystals, tuning forks, color and essential oils. 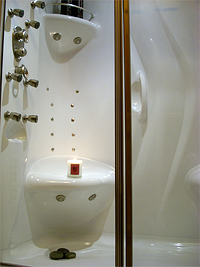 Private room with steam, shower and essential oils. Increases white blood count and circulation, aids in lymphatic drainage, pores open and toxins are naturally moved out of the body.